Stocks of the Emerging Markets remain under pressure on Wednesday morning, with positive sentiments prevailing in American markets following strong macroeconomic statistics. MSCI for Asia-Pacific region has been updating its lows since July 2017, losing 0.5% on Wednesday. Hong Kong’s Hang Seng loses 0.2% but is also in the area of 14-month lows. Both of these indices have entered the oversold zone on RSI, which reflects a strong impulse for the decline, but also requires attention to a possible rebound. However, bears seem to have an upper hand for now on EM against a verbal skirmish between China and the United States regarding the trade. Trump noted that he had a tough stance against China, and Beijing told it would request WTO for sanctions of $7 bln. per year against the U.S. due to non-compliance with the trade negotiation procedure. On the contrast, the U.S. markets were gaining on Tuesday, relying on strong statistics. S&P500 added 0.3%, having recovered after the data from earlier intraday decline. The Small business optimism index has reached a new high in its 45-year history following the most intensive plans to increase jobs, expand investments and increase stocks. 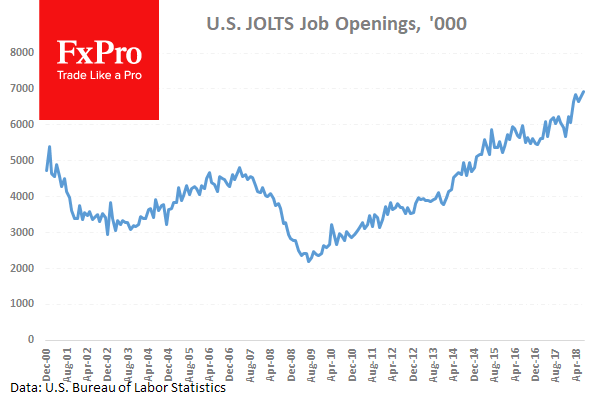 Separately, according to JOLTS report, the number of open positions in July reached a record of 6.94 million, which is greater than the number of unemployed ones that are 6.2 million, also it is noted that the number of those who voluntarily change their work grows. These are the signs of labour market strength, foretelling acceleration of the salary growth that we saw at the end of the last week in Payrolls report on August. The enthusiasm around the confident growth of the U.S. economy creates expectations of higher rates from the Fed. The markets put 80% chance of the rate rising in September and December versus 71% a week earlier and 60% a month ago. However, this seems to be insufficient for the growth of the dollar. The EM currencies put on pause their decline on the assumptions that strong statistics in the United States will support global growth rates. The dollar index has been around the 95.0 level since the beginning of the month. EURUSD has retreated this morning to 1.1580 after a failed 1.16 test yesterday, GBPUSD has returned under 1.30. Strong U.S. data and the news that Hurricane Florence could become the strongest in history, hurting oil production in the U.S., caused a spike in oil quotes. Brent rose to $79, the level, above which oil has not been sustained since May.